Connecting with the outdoors is vital for our physical and mental health, and the Minnesota Land Trust works to build those connections for people across our state. Whether it’s protecting public and private lands, restoring natural systems, or working with partners to get youth outdoors – creating opportunities for outdoor experiences and recreation is a key part of the Minnesota Land Trust mission. Learn more about our recent work below. Duluth’s Mission Creek Trail. Photo by Hansi Johnson. In 2011 the Land Trust entered in to a partnership with the City of Duluth to protect and promote the city’s nature-based recreation assets. With more than 10,000 acres of public open space within city limits and more than 300 eventual miles of trails, Duluth recognized that it could not take on responsibility for its infrastructure alone. Redesign and reconstruct the shoreline at Chamber’s Grove Park to improve fish spawning habitat and create ADA accessible fishing opportunities. Climbing at Quarry Park. Photo by Hansi Johnson. The Land Trust has also led restoration in the St. Louis River Estuary, working with a number of local groups on the largest ongoing wild rice restoration project in the United States. Read more about our work in the St. Louis River Estuary, and how a once heavily-polluted river is becoming a magnet for outdoor recreation. The Minnesota Land Trust works closely with camps and nature centers across our state to not just protect the land and water they rely on, but also to keep their doors open. By preserving their land with a conservation easement, camps can reduce the pressure for development of their land, and potentially free up resources through the easement process that can be reinvested into the camp facilities. And if the camp does have to close in the long term, the lands and water will still be protected in their natural state by the Land Trust – forever. Youth Outdoors Duluth. Photo by Hansi Johnson. The benefits of spending time in nature at an early age have been known for years, but for many children, there can be a lack of equitable access to outdoor experiences. 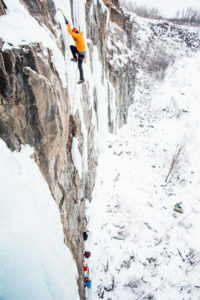 This “Adventure Gap” goes beyond the shortage of equipment for outdoor recreation, but also includes the lack of access to outdoor locations, experiences to build upon, and role models to draw inspiration from. With support from the Northland Foundation in 2016, the Minnesota Land Trust and City of Duluth helped organize a group to address this gap, and with support from the community, Youth Outdoors Duluth was born. With a mission to ensure that all youth have access to nature-based experiences through community-wide coordination of resources and expertise, Youth Outdoors works with a number of community and family groups in Duluth to plan activities which bring underserved youth outside. 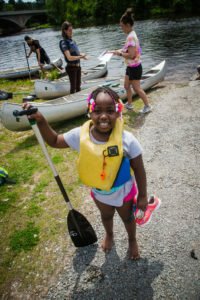 In its first year alone, Youth Outdoors Duluth helped over 420 kids by offering activities including archery, rock climbing, canoeing, hiking, skiing, and more. In all, youth spent over 14,000 hours getting some fresh air! The group is going strong and with continued support will have an impact on the lives of many more youth.